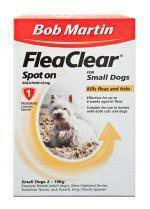 Bob Martin FleaClear Spot On Solution for dogs is for killing fleas and ticks on your dog. Applied at the back of the neck and between the shoulders, each treatment provides protection against fleas for up to 8 weeks and protects from ticks by up to 4 weeks. This product does not prevent ticks from attaching to dogs but will kill ticks within 48 hours. Bob Martin FleaClear Spot On can be used on dogs over 2 months old and is suitable for use in homes with both cats and dogs. How should I use FleaClear Spot On? Use one tube per dog, applied to the skin as directed. Suitable for dogs that weigh between 2-10kg.